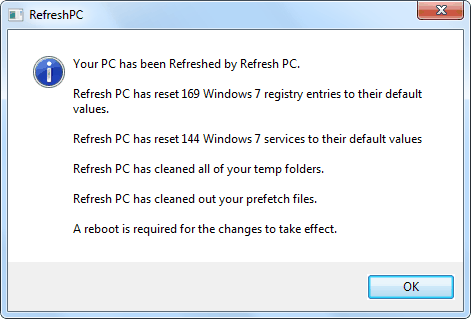 On my quest in searching for a tool or software that can actually restore deleted services that belongs to Windows and not just simply restoring the startup settings, I found a tool called RefreshPC which claims to refresh system services. 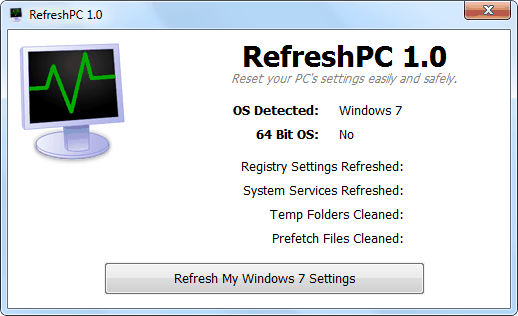 RefreshPC is a free tool created by the same company that develops XP Smoker or 7Smoker that is able to reset registry settings, system services and clean up temporary folders and prefetch files. RefreshPC works on Windows XP, Windows Vista, Windows 7 and Windows 8 on both 64bit and 32bit versions. The screenshot of the program shows that RefreshPC is an easy to use tool that is able to automatically perform all 4 actions by simply clicking a button. I tried clicking the Refresh My Windows 7 Settings button on my test machine and within seconds a report window pops out telling me that it has reset 169 Windows 7 registry entries to their default values, reset 144 Windows 7 services to their default values and cleaned all of temp folders and prefetch files. That’s it. I can’t find any log nor information on what was being “refreshed” after clicking the button on RefreshPC. As we all know that the Windows registry is a very sensitive area where if you wrongly deleted an important registry key, Windows may not work properly. So before even attempting to use this tool on my client’s computer, let us investigate which registry entries and services that RefreshPC resets. The easiest way to check which registry values are being modified by a process is to use RegFromApp. First run RefreshPC, then run RegFromApp as administrator. Select the RefreshPC process listed in RegFromApp and click the OK button to start injecting. Click the Options from RegFromApp menubar and select “Add Only Modified Values” to uncheck that setting. Go back to RefreshPC and click the “Refresh My Windows 7 Settings”. When RefreshPC has finished refreshing the registry settings and system services, go to RegFromApp and you will see a list of registry values that is modified by RefreshPC. RegfromApp shows that RefreshPC does reset a lot of Windows settings back to default which can be quite useful but as for system services, it merely resets the DelayedAutoStart which I wouldn’t consider it as really “resetting system services”. If a service has been removed by a virus, simply adding back the DelayedAutoStart value alone will not restore the service. During installation, please take note that RefreshPC setup installer by default enables installation of WareSoft Search Toolbar. Uncheck all 3 checkboxes to prevent the installation of WareSoft Software Toolbar, setting home page to waresoftsearch.com and Yahoo! as default search provider, then only click the Next button. Thanks ray for posting. My windows update was not working but now its working. This managed to screw up my WIN + Arrow key shortcuts (for dock left, dock right, maximize and restore window). It worked fine before I ran it. And I ran it cause I had a task manager issue that I had hoped this would fix, but no such luck..
Any idea how to restore those shortcuts ? Thank you for the write up about my software. I would like to mention that if the services are already at the default configuration, or are very close to the default configuration, very little changes will be made. If there are massive changes from the default configuration, you will see massive changes. The same thing with Norton Security blocks the program before it could load on. Hi, I can’t get on that website as it’s blocked, I get redirected to this page, 7 trojan/virus’s. Definitely a false positive. RefreshPC does not make any dangerous changes on a Windows computer other than just resetting them back to default values. I am working on trying to get this false positive resolved with Symantec. Question, If I made some changes to my register. As example, making my cache larger in my register of my internet explorer. RefreshPC will not reset the Internet Explorer cache size. However, the start menu speed will be restored back to default because I see “MenuShowDelay” on the list.